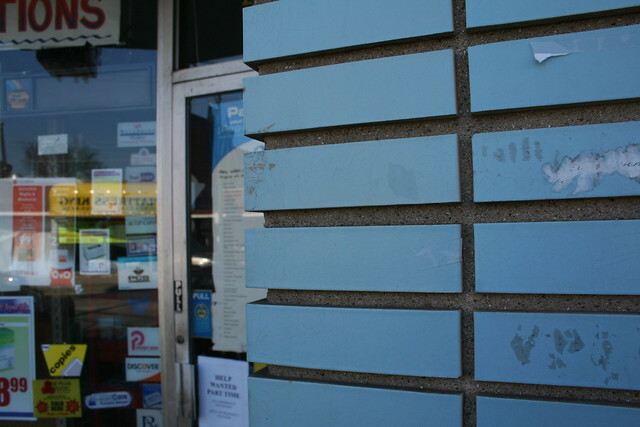 A blue-brick accent at the Devon Avenue storefront of Rosen’s Morseview Drugs. Note the vertical stacking pattern of the bricks, as well as the deeply troweled, straight-edged mortar line between them, both of which emphasize the geometric quality of the pier. 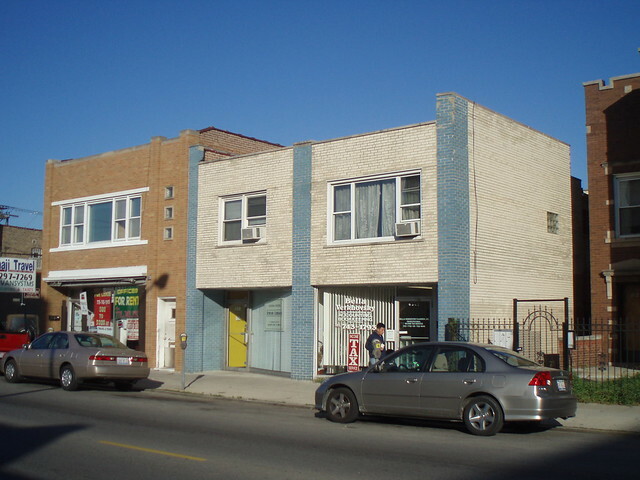 6404 N. Richmond Avenue / 2936-2938-2942 W. Devon Avenue – largely a plain box, this mixed-use building has two levels of apartments over retail at the ground floor. The brick shows up in a few framed panels on the side street, and, more interestingly, in the side walls of the shallow balconies. 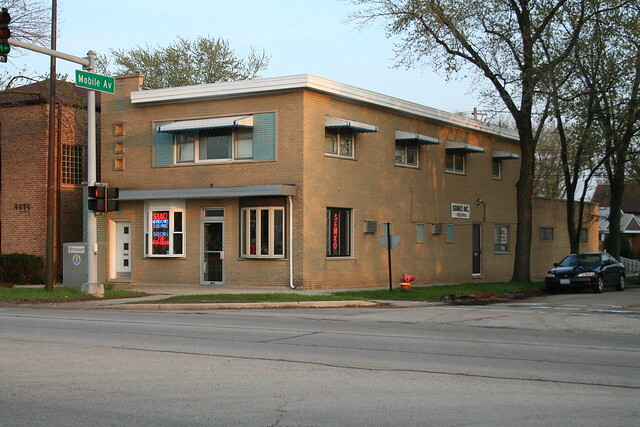 2955 / 2957 / 2959 W. Devon Avenue / 6347/6357 N. Sacramento Avenue – opened in 1962. Four stores with one level of apartments above. The colored brick pops up a lot more on this one, showing up in a window band, turning a corner, and covering all the building’s retail-level columns, piers and storefront bases. Limestone trim frames the upper level. 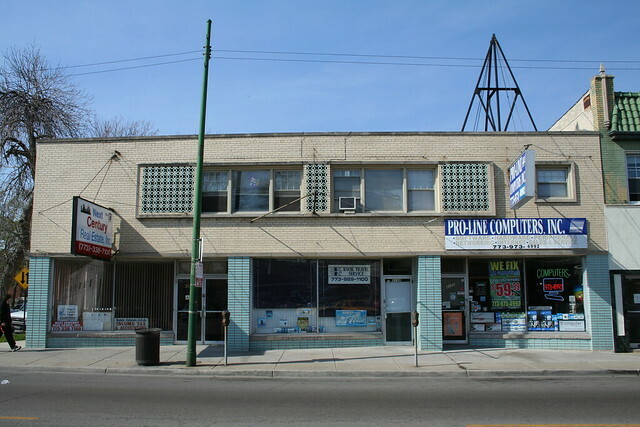 This building has been home to Rosen’s Pharmacy (and its successor, Rosen-Morseview Pharmacy) since the building’s opening. It moved in from across the street, where it had operated since at least 1949. 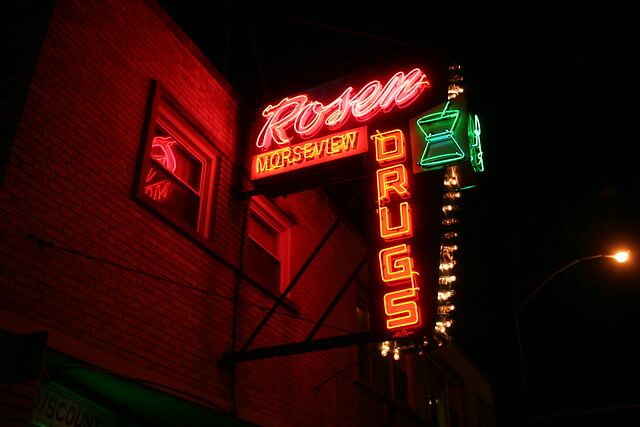 As a bonus, here’s a shot of the fantastic Rosen Morseview Drugs neon sign shining bright, as it still does to this day; it is the last surviving vintage neon on Devon Avenue. 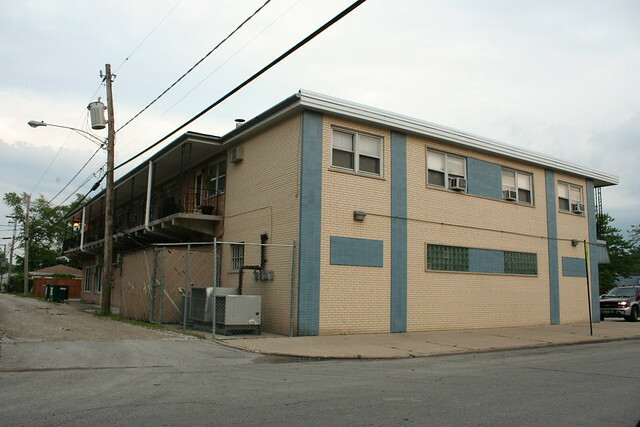 3120/3122/3124 W. Devon Avenue / 6401/6411 N. Troy Street – opened by 1960, when the real estate dealer for the building – Bernard Katz & Co. – moved in to have larger quarters. They had previously been located about 9 blocks east; they remained here until moving to Skokie in 1978. 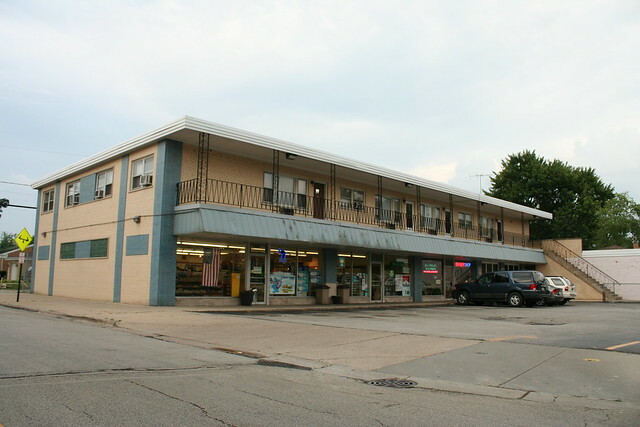 The building is a close sibling of the previous one, with one level of apartments over four retail outlets, one on the side street and three on the main avenue. Also repeating are the blue brick piers and storefront bases at street level, the banded windows, and the limestone framing; this time, however, there’s a far more harmonious composition of windows, infilled not with the usual blue brick but with matching blue pattern blocks. 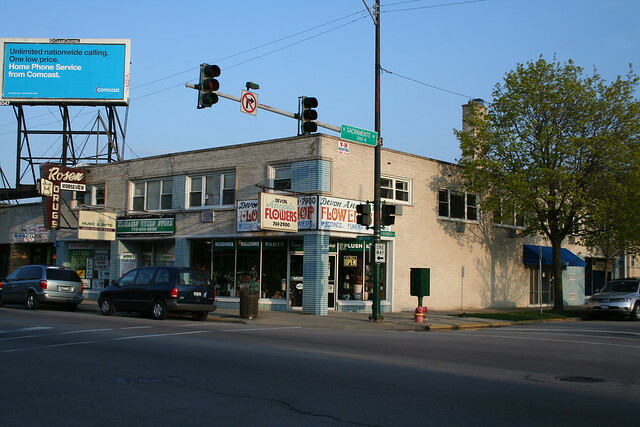 These two buildings have a pair of close cousins out on Bryn Mawr, in the commercial district that’s sandwiched between the North Branch on one side and the old TB sanitarium on the other. 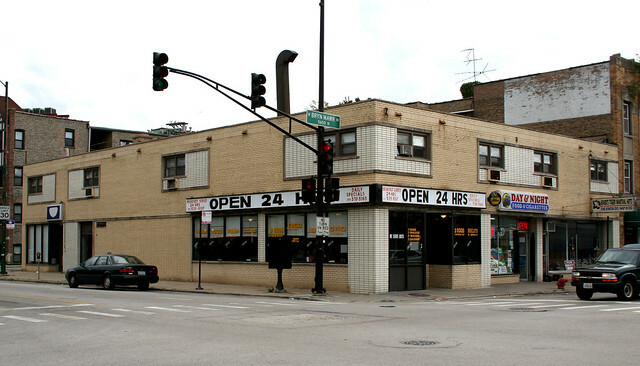 3412-3420 W. Bryn Mawr Avenue – appears in one of People’s Gas ads, nailing its date down to 1963. Architect Irwin A. Sugarman, an Armour Institute graduate in practice since the 1930s; builder Broadway Construction Co. The building form is the same – 12 solid-walled apartments over 5 glass-walled storefronts – but the color scheme is inverted. Glazed white bricks form the piers, the infill panels, and the base of the storefronts, while a dull blue brick is the primary wall material. 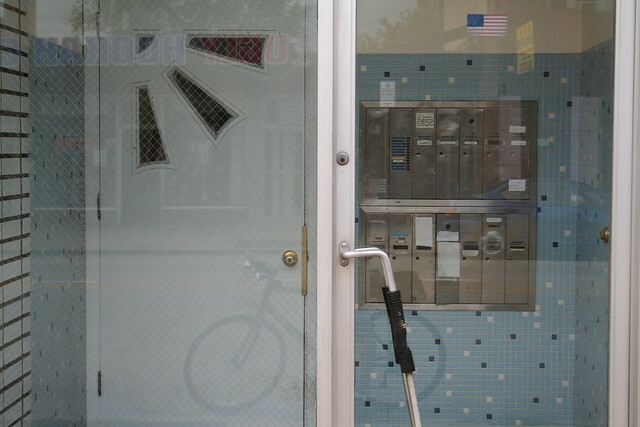 The doorway to the apartments upstairs is dressed up with 1×1 mosaic tile and a snazzy mid-century door. 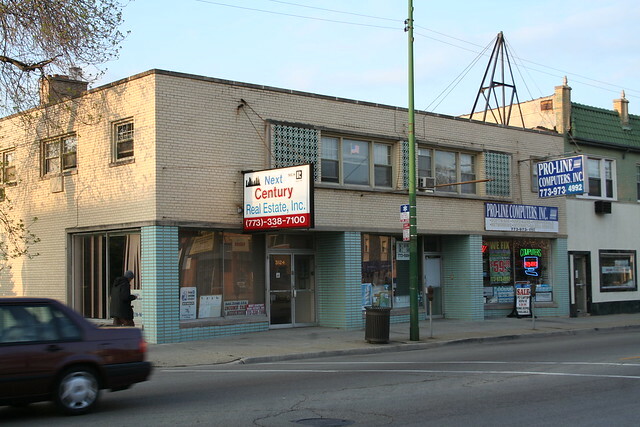 3401-05 W. Bryn Mawr / 5552 N. Kimball Avenue – open by 1963. The address made headlines in 1982 when a resident claiming to be a sea captain, and to own a vessel in Florida, offered to transport local residents’ relatives from Poland. The cops arrested him in a full captain’s outfit. The color scheme here becomes cream-on-blonde, but the form is the same. 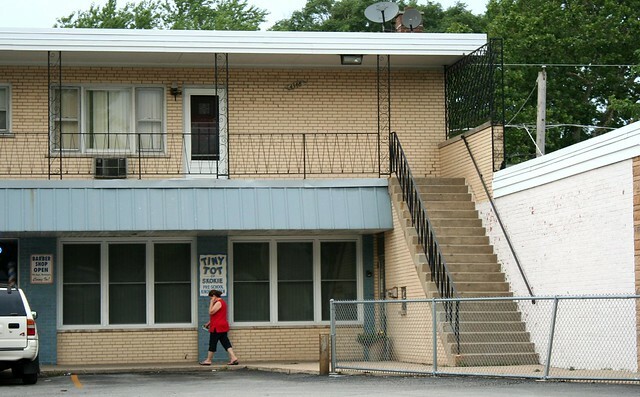 This building has lost the piers, and the windows are inexplicably smaller than their decorative brick surrounds, leaving L-shaped patches of cream brick. 6329-6331 N. California, south of Devon – opened 1965? A sad and tattered little specimen. Three piers of blue brick demarcate two bays, with angled storefronts between; the building is utterly bereft of ornament or interest otherwise. Those actually are a couple of apartments over the stores, accessed through a little door in the right-hand storefront bay. 6259 W. Touhy Avenue, Chicago – 1966. Taking a big leap west, we come across this lovely specimen on the northwest city limits. The blue brick accents the building multiple times: at a single window band on the second floor, on a couple of outlined rectangles on the side, on a pier at the entrance, and in a delightful little geometric design over the door that combines brick elements and geometric glass block with limestone frames. The primary brick is a much dirtier blonde than on previous examples. An unusual mixed-use building. 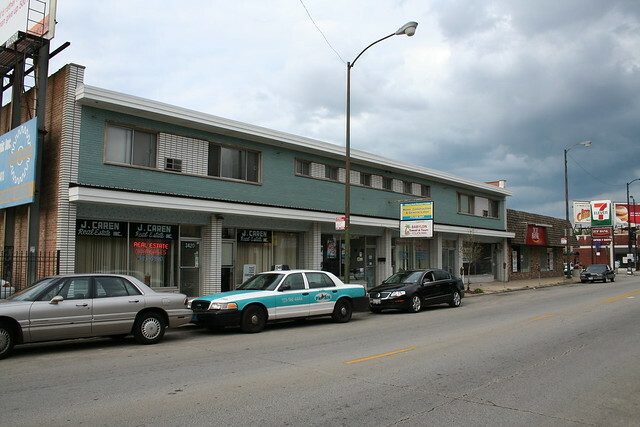 At ground level, the building is currently home to four storefronts including the Kostner Korner convenience store, a dry cleaners, a barber shop, and a daycare center. 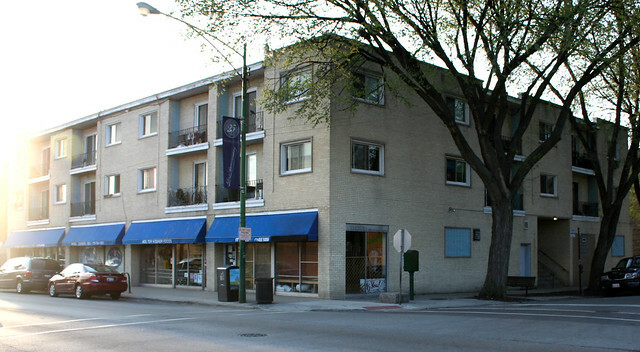 Above, it houses four breezeway apartments with front and back access, reached by a single-run stairway projecting out from the building; thanks to that stair, it has a most curious relationship with the storefront building next door (4346 W. Howard), as they share a wall and are both part of the same daycare business. Somehow I missed their symbiotic relationship when I was standing in front of them and hence never got a shot showing them both, but from the Google Streetview it’s obvious, and makes it seem likely they went up together. 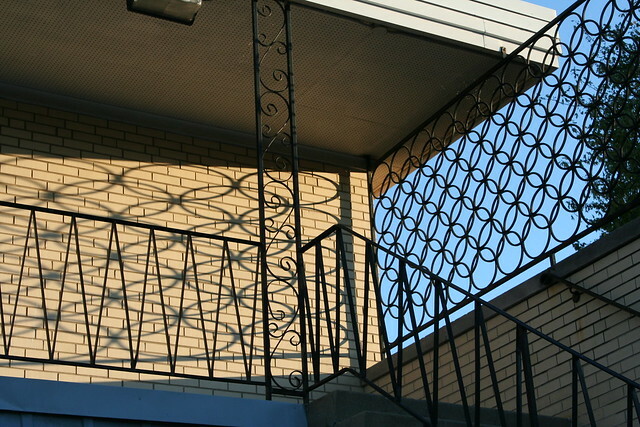 The railings, and the screen separating the apartment balcony from the roof of the one-story building, are particularly lovely. Reflecting the walk-up vocabulary of the Rogers Park buildings, blue brick is used in a corner pier, accent stripes, window bands, and ornamental rectangles, all in stacked bond. The awning overhang has been painted to match, approximately. And that’s not all. Tune in next week for Blue on Blonde part 3, when we’ll be bringing it all back home! 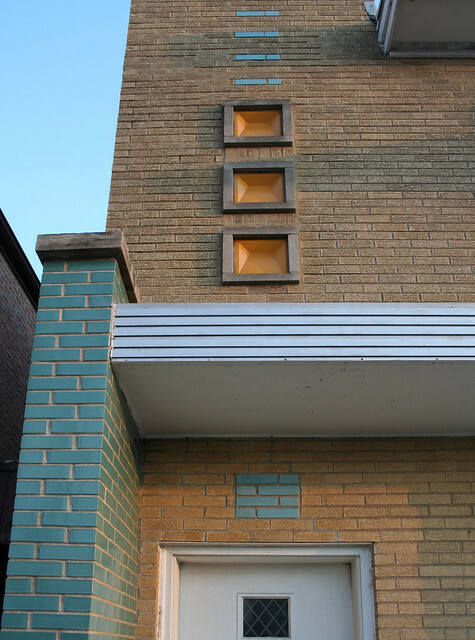 This entry was posted in 1960s Glazed Brick, Devon Avenue, Mid-Century Office and Commercial, Mid-Century Retail and Storefronts, Neon Signs. Bookmark the permalink. Great pics! Thanks for sharing. 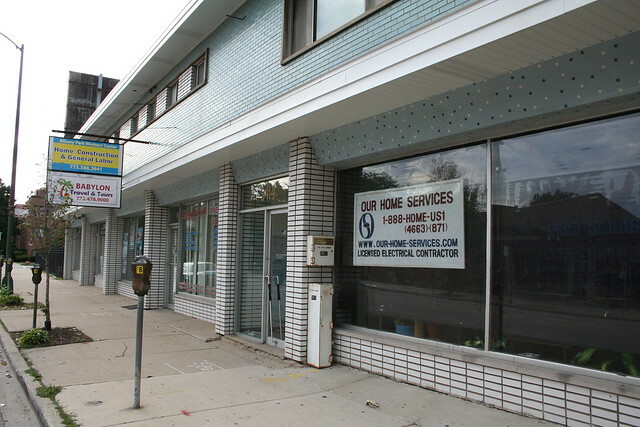 I can tell you a little more about the buildings at Howard and Kostner… the daycare center Tiny Tots originally began in the smaller building that you missed. Both my sister and I attended there in the early 60’s, so the buildings themselves were most likely built in the late 50’s up to 1962 at the very latest. I’m betting it was closer to 1960 since many homes in that area went up about then.